The continuous measurement of molecular hydrogen (H2) emissions from passively degassing volcanoes has recently been made possible using a new generation of low-cost electrochemical sensors. We have used such sensors to measure H2, along with SO2, H2O and CO2, in the gas and aerosol plume emitted from the phonolite lava lake at Erebus volcano, Antarctica. The measurements were made at the crater rim between December 2010 and January 2011. Combined with measurements of the long-term SO2 emission rate for Erebus, they indicate a characteristic H2 flux of 0.03 kg s–1 (2.8 Mg day–1). 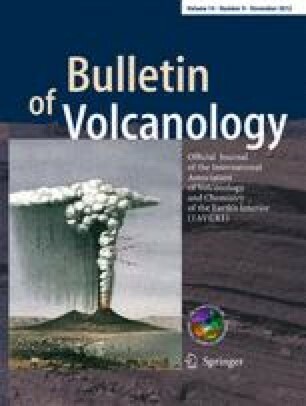 The observed H2 content in the plume is consistent with previous estimates of redox conditions in the lava lake inferred from mineral compositions and the observed CO2/CO ratio in the gas plume (∼0.9 log units below the quartz–fayalite–magnetite buffer). These measurements suggest that H2 does not combust at the surface of the lake, and that H2 is kinetically inert in the gas/aerosol plume, retaining the signature of the high-temperature chemical equilibrium reached in the lava lake. We also observe a cyclical variation in the H2/SO2 ratio with a period of ∼10 min. These cycles correspond to oscillatory patterns of surface motion of the lava lake that have been interpreted as signs of a pulsatory magma supply at the top of the magmatic conduit. This research was supported by grant ANT-0838817 from the Office of Polar Programs (National Science Foundation) and grant 202844 (“DEMONS”) from the European Research Council (FP7). YM was additionally supported by the University of Cambridge Home and EU Scholarship Scheme, and CO acknowledges funding from the National Centre for Earth Observation (Theme 6: “Dynamic Earth and Geohazards”). We are grateful to Hiroshi Shinohara and Eliza Calder for their constructive reviews of the original work. We also thank Tehnuka Ilanko, Bill McIntosh, Nial Peters and Aaron Curtis for assistance on Erebus. Jones L, Frechette J, Okal M, Kyle P, Oppenheimer C (2011) Observing the dynamics of Mount Erebus using a terrestrial-based LiDAR (abstract). Polar Technology Conference, Albuquerque 24 Mar 2011. http://polartechnologyconferenceorg/2011_pdf/PTC_2011_Jones.pdf.